With a sad farewell to mum left 2.30 from the airport at Christchurch to arrive LA same day at 1pm! Yellow haze of LA in the distance didn't mind escaping after dumping bags at the hotel for a run to the bus going to Manhattan Beach with its mish mash of housing styles, 'all over the place' Mediterranean, mock Tudor and Cape Cod styles. Off for a wander down the pier we saw it was clean of rubbish but a sign 'DO NOT eat contaminated fish caught from the pier. White pointer sharks must be released unharmed!' Designer hamburger with an Angus beef patty was delicious so all that was left to do was swim and spa before an exhausted sleep. Caught the bus to Vinales and found our casa particular (bed and breakfast.) Vinales is a long spread out town surrounded by limestone escarpment which reminded us of Laos. Lots of agricultural activity, corn, tobacco and horses. Walked through the countyside to an organic farm, dusty red earth. Enjoyed an organic Mojito, mint, honey lemongrass and local rum. Dinner at home of lobster, bean soup and a huge plate of rice. Julie in heaven. Our bus to Cayo Levisa left with the usual scramble of Julie searching high and low in her bag for lost tickets. A mad dash back to camp was luckily forstalled due to finding them but it's another country with a policy - no ticket no nothing. The paperwork must be had. We drove through hilly limestone water sculptured crags and red dirt fields with bright green crops. Past farmers driving ox and carts over broken roads I couldn't help but think of the contrast as we passed tourists in their smart rental cars, how this will play out for infrastructure in the future? The roads are really narrow. Then a short ferry to the island of bleached white sand, sapphire waters and sunburnt tourists. The dated bungalow style hotel has with none of the glorious architecture of Asia. Slipping into the warm water among purple fans of coral, I chased a barracuda and swam amongst the fish as the boatman fed the fish with bread. After our run around summer of work it was bliss. We picked up bikes and within a few minutes we were off the beaten track passing a sled filled with a water tank pulled by oxen and an obliging local who was friendly and happy to pose for my photo. A young man passed us on his bike and began giving us a bit of history of the area as well as telling us about his father's car. After each trip away the old antique American car needed repairs and cost a fortune. So now it's used as a taxi in order to pay for itself. The whole country looks like an antique car meet. New cars are so expensive and people are resourceful keeping them repaired and restored. Touristy Cueva del Indio, an ancient indigenous dwelling cave was only discovered in the 1920s and a good destination. George had suggested a great place for lunch but think she would have been horrified by the numbers of US tourists which detracted from nice views, so back for a pizza on the street. A bit of research and our new found friend Maps.me which we had downloaded from the internet, got us wandering on a maze of trails though cultivated fields up to a wonderful restaurant Balcone del Valle, where I ate tuna and J pork. An amazing view of tobacco fields, drying houses and not too distant domes of craggy limestone. A full belly got us back to our place for an early night and big rest. One thing we notice is the electric scooters and the absence of smoke. Electricity appears to be widespread and must be inexpensive. Today though wasn't about moving fast as we paused to enjoy the dramatic karst landscape. We set off with our GPS to Cuevas del Palmarito using farm trails through farm fields of corn and sweet potato. The fields must look the same as they have done for hundreds of years. Rust red soil ploughed by oxen and the only wheeled transport, ox and horse cart making making a quiet and peaceful ambience. One of our highlights was entering a rustic A frame shed to find it filled with layers upon layers of brown and yellow fragrant tobacco leaves hanging in rows and rows. The shed was thatched with palm leaves to control the drying process. We opened a taranaki style gate to a cigar chewing horseback farmer who stopped to made sure we closed the gate correctly behind him. "Gracias" his only comment. The GPS sent us up to a cave which was the shortest route. We didn't realise that we needed to walk 50m through darkness to come out the other end of a whole new vista until we got courageous and walked through the dark. We saw a red backed bird which was a woodpecker and a lizard basking. Our destination was a big cave where we could swim, a bit like a wadi in Jordan, but in complete darkness! Great to wash off the sweat. Back toward town we had to stop for a mojito at Senor Paul Reyes farm, where we also picked up organic coffee beans, rum and chilli sauce, presents for our friends in Havana. Buying a bus ticket back to Havana was interesting with a hot and sweaty queue of tourists. Dinner at La Cocinita del Medio was smoked pork and chicken, delicioso! Another wander through the fields this time with the thought of cooling off. We arrived at the outdated pink colonial style Hotel Los Jasmines for a swim in their pool. In the end the loud music, lack of shade and cigars smokers drove us off but spirits were still high with Bacon De Valley close by for a fish and chicken lunch. Unforgettable views we will remember is the mogotes, stately royal palm thatched tobacco drying houses and the ox ploughed red fields. On the way back we saw a kestrel on a post and when the lady sweeping picked it off the post we realised it was tame. Humberto was called to give us a guided talk in the tobacco house. Very interesting, he rolled up a cigar and gave us a great insight into the process. A wee while further on we met Leonardo who also wanted us to have look at his tobacco house and buy some cigars! After all he was happy to swap somberro for Jos cap and pose for a photo! Before we knew it, the day was done. El Jardin Las Herman, the garden of the sisters was our first stop. In over two hectares the women who pioneered this garden grew over 900 species during their time. We enjoyed our guide who explained much about the vegetation we had puzzled over. We learned about the the Kapok, which is a holy tree to the people and native to this country it was interesting as we had passed one marked church on my map with figurines in the base it was used for a shrine in the fields. 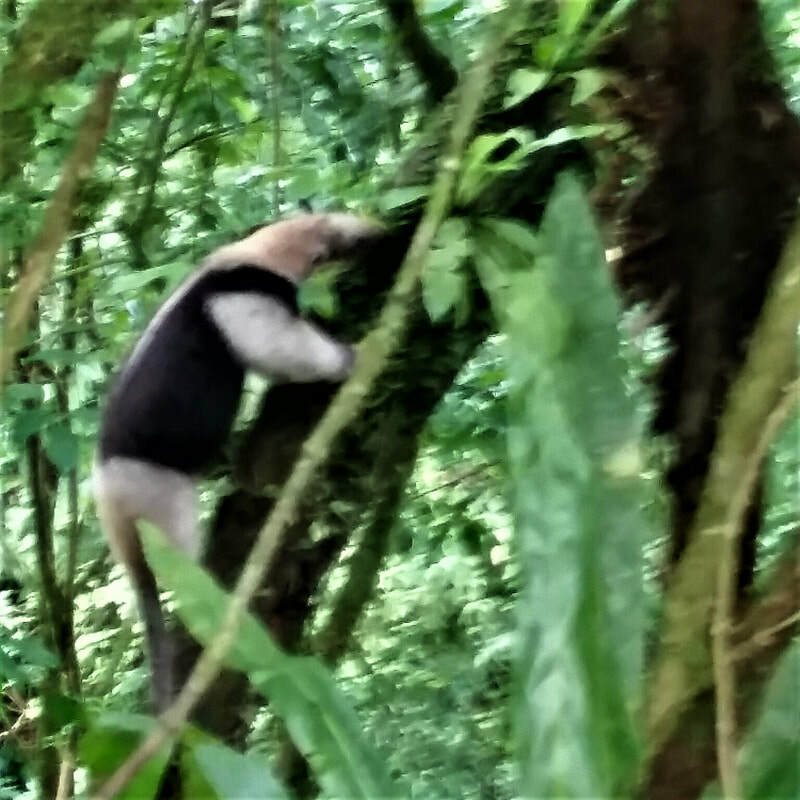 We also saw a cocoa tree, the prickly trunk of a silk tree, orchids and bromeliads and edible fruit trees which made for a great cool walk in a tranquil setting. We wandered up the hill for more views then sadly time to pack and leave. The ride home astonishingly fast, instead of the bus a taxi took 5 of us at speed back to Havana. "We have a mini bus for you, 2 1/2 hours instead of 4! All my smiling at the ticket man worked as I was singled out to join this lucky party. The taxi bought us straight back to our casa for an extra $10 and we were back. A swim in the ocean nearby and pulled pork for dinner, we were knackered. First lesson of the day, how to get around like the locals in a taxi collectiveo. 1. Stand on the main road and wave horizontally (palm down) 2. shout your destination at the driver 3. He stops, you get in and get out, pay 1 cuc. Worked fine! Next was to find the local bus to take us under the tunnel to Havana’s fort which features grand views of the strategic harbor — protected with the threat of many cannons. Havana was the obvious spot for those Spanish conquistadors to establish a safe port to serve the colonial trading ships. Sipping the local brewery beer later in the square, in a stone colonial building that was beautifully reconstructed we see that Havana’s heritage goes way back. Many of the cars are American classics from the 1950s. Once Cuba and the USA became enemies back in 1960, the American embargo locked the country into a 1950s time warp. Wandering around old Havana we see Che Chevera everywhere, peer down alleyways with fallen power lines, dilapidated buildings amongst renovated and smell the diesel fumes. What a mix. Biking around on our own this time first stop was thd Hotel Nacional de Cuba, which offers 5 star service in the heart of Havana. This is a rare feat, as most hotels in the city have not been well-maintained. The hotel has a rich history that dates back to its opening on Dec. 13 1930. In 1982, the hotel was named a UNESCO world heritage site. Our guide was a retired history professor and once wore the revolutionary uniform, now a display item in a bunker doubling as a exhibition of the Cuban side of the missile crisis we remember as children. After a coffee stop we rode through the historic Habana Veija, narrow streets lined with buildings in various stages of renovation or decay. There is a trust that is trying to restore the area from the profits of tourism but also has an aim of keeping the area alive with homes and social housing. Highlight was the market in a sugar warehouse. Next the wonderful church at Plaza de San Francisco with displays of antiques religious costume and artifacts. We got home just before a massive thunderstorm, the rain flooding the street. We were invited to a party with our hosts. We met expats and had interesting conversations with some disparaging references to " our cousins to the north "... These people are waiting for the effects of the changes the new administration will bring. Another very smooth journey (but not taken for granted) as we were dropped off soon after 6am by our hosts who we owe much. Sailed through formalities we were in Panama in no time with a short flight of over two hours, it was obvious to us immediately we were somewhere quite different. Soaring skyscrapers house the banking world and a thriving cosmopolitan centre, yet as we drove in (halving the price of the taxi just by a ten minute walk to the bus station, the joy of carry on only!) the first impression was chaotic, noisy, smelly and loud which has prevailed as we meander round pot holes, slums and dilapidated buildings in between renovations of what must have been bare boned facades into magnificent restored mansions. How this must have looked in the past! In 2003 this area became a UNESCO site. The Panama Canal Day started by a crushed tube ride then a 20 minute wait in a queue for the bus to the Miaflores Visitor Centre. We are determined to do it like the locals do and by golly it was hot and unpleasant. Exactly what the locals have to put up with every day. When we complain about how busy the streets in Franz Josef are in the summer, it's not a patch on this. When the Spanish arrived in the 16th century they decided to to create a route that would cross the isthmus and join the Atlantic and the Pacific ocean saving shipping around Cape Horn via an all water route. It was the French who started the construction in 1880 but 20 years later they gave up because of malaria, financial problems and the huge undertaking was over ambitious. Not long after that, in 1903 after independence, Panama negotiated with United States to finish construction of the Canal, and on the 15th of August 1914 the Canal opened until 1990. Panama then took over the administration. From the Pacific side the ships are raised in two locks to Miaflores lake up. Another lock then raises the level to Gatun lake at 26m above sea level. On the Caribbean side three locks lower the ships back to sea level. Watching this in action was thrilling as the ship slowly descended in the lock as the water equalized, then the massive gates opened and the vessel moved on at the new level. A day of living not lost for traveling as we did, flying to Costa Rica but there was a price to pay, exhaustion! Heart stopping as we hailed a taxi at 5.30am only to come to a grinding halt at a traffic jam. Honestly? Before 6am. Our trusty driver did a u turn after awhile and we were off, only to wait in a massive queue that got much worse behind us. We lost another hour and made it to sandys at 10.30am! Her condo is beautiful as is she, making us so welcome. Located on a steep hill, the outlook is terrific, all over the city. Open and airy, the best thing of all is that we are up at 1600m and it's cooler and comfortable after the oppressive heat we have been dragging ourselves round in when everytime a walk outdoors makes for gasping in shock at what is about to be endured. Sandy (who has never caught a bus) and her maid Norma (who only catches buses) got us all set up for our bus ride to San Jose the next day over lunch. A walk up a very steep hill in this million dollar plus mansion views area had breathing deeply indeed. A deep deep sleep waking to the morning chorus which commenced at 4am, just like home in summer! We had a leisurely start to the morning chatting over breakfast with Sandy. Next our first foray into downtown San Jose, taking the auto bus to the centre and wandering around the streets. 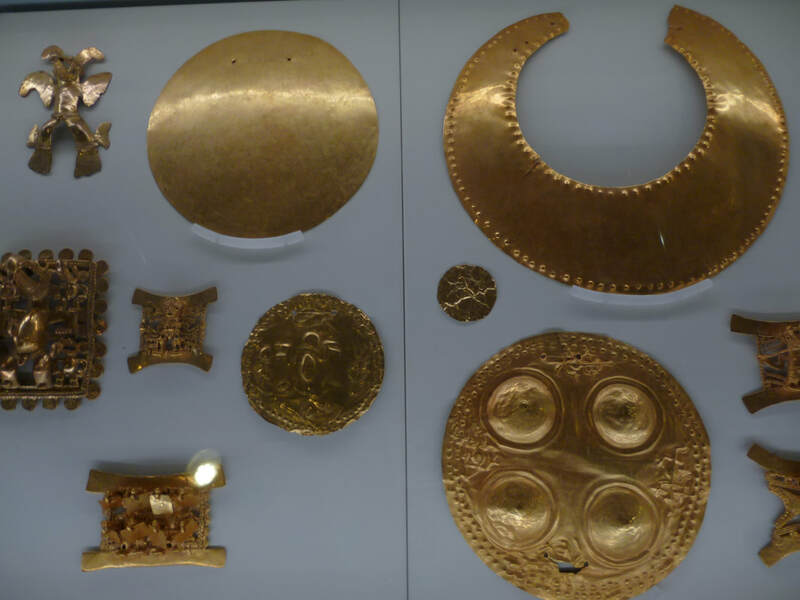 The museum of pre-Columbian art and currency took our fancy, it is located under a Plaza in a three story concrete vault, complete with bank style steel doors to secure the incredible gold artifacts on display. There were dioramas of village life and culture, displays of pottery and gold artifacts and explanations on early mesoamerican metallurgy. 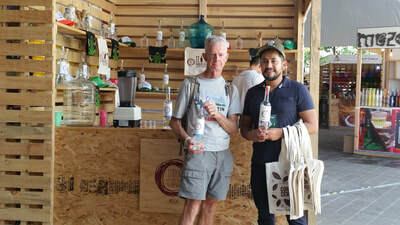 For an up to date exhibition of tico culture we wandered the streets and had some snacks at the Mercado central, also sorts of small stalls selling everything from sowing supplies to health foods to fresh veg and meat, plus numerous food stalls. We bravely bought a toasted sandwich, then tried a large pancake on banana leaf, thoughtfully enclosed in two plastic bags... It tasted of cheese, corn, oil and salt, very filling. The idea of a coffee tour was aluring despite the fact that it was never going to be easy access by bus. We arrived, three hours later after a wrong long bus and being ripped off by the driver! But we were high in the hills, looking out on coffee bushes, a smoking volcano samples of coffee to try (inhale at that stage) and we had the place to ourselves. Ariana, our own personal guide gave us an in depth intro in the world of coffee. The small berries are picked by Nicaraguan workers for $2 a bushel. The beans are then sorted by floating in water, the heavier beans being the best quality. Fleshy skin is then removed, the beans are soaked to remove slimy outer coating. After a day they are then dried in the sun for five days. They are now ready for bagging and export. The longer beans are roasted, the stronger the flavour. Italian coffee is roasted for 20 minutes. 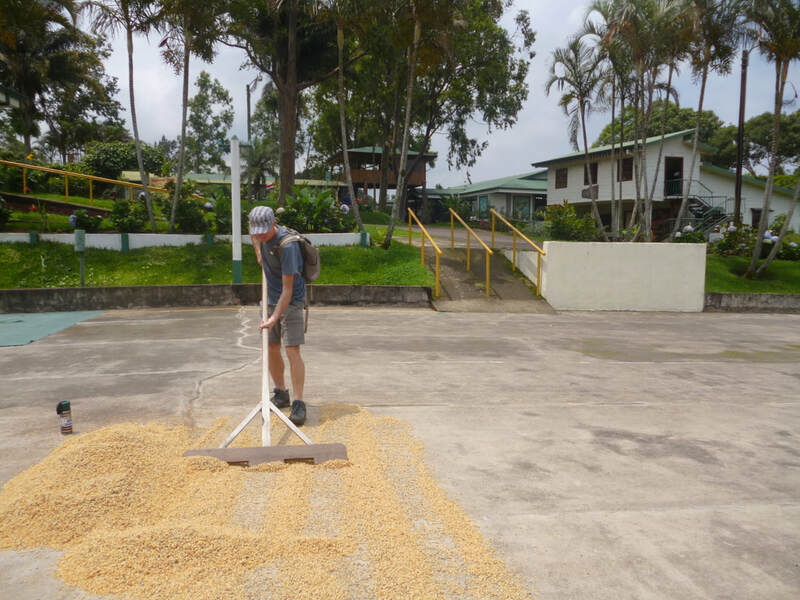 There were eucalyptus, mangos, bananas and papaya trees planted to act as a decoy so that the birds don't damage the coffee berries. ​Two of our fav things, coffee and chocolate. Already sussed out the coffee process now it was the turn of chocolate. Senor Olivio picked us up in a beat up ol' Toyota as we were off to the family finca, yahoo. 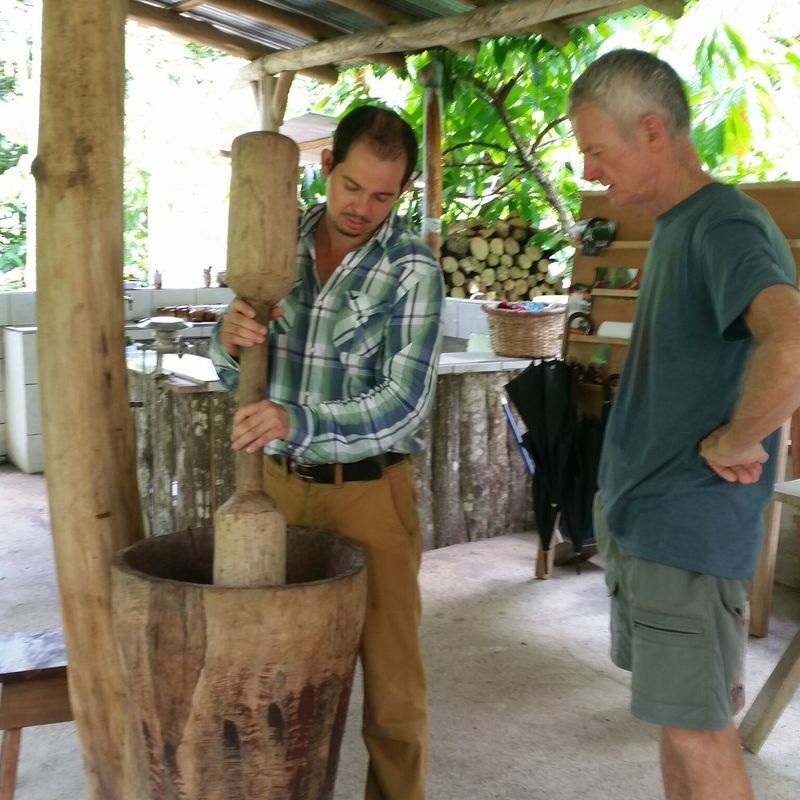 Quite authentic in every way, this Dad and Dave operation just for us, was a great insight into the growing of tropical fruits and medicinal plants but most of all, best of all was the massive cocoa fruits, that in many years of the tropics, I had never seen before. The reason for this is because the multinational banana company spread a virus that weakened cocoa trees because the growers would not switch to banana growing preferring cocoa as the story went. The pods are opened, the beans then fermented to remove the slime and sugars (similar to coffee we thought) then seeds dried, roasted and shelled. Mincing the product we have pure cocoa, viola! With the addition of a little raw sugar, we ate delicious samples, along with liquors of chocolate and coconut rum. Deliciouoso! Just for something a little less exciting (not really) it was off to the reserve from last night's night walk to spy on many more species including the heliconia, orchids and palms. 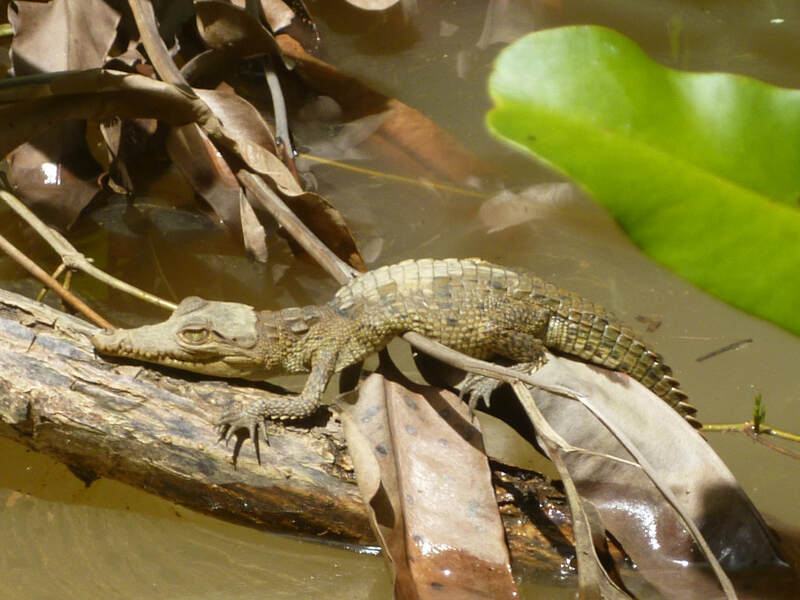 Not sure if it was a two or three toed sloth, large numbers of birds (There are more than 150 different species) basilisks, iguanas, insects, poisonous red frog, among others. Additionally it has a butterfly farm breeding larvae, pupae and eggs with 30 different species of butterflies and a lake that is natural habitat for many species of animals among which highlights the Chocuaco (Boat-billed Heron), the red-eyed tree frog (Agalychnis callidryas) and the caiman (Caiman cocodilus) among others. 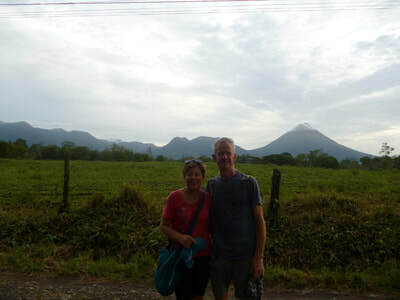 Today we got picked up outside Christian 1 supermarket to go to Arenal Observatory Lodge. Great when the taxi arrives on time. Drove up towards the volcano past a slew of hotels, spas and hotspring establishments. The initial idea of using bikes to get around quickly paling due to the steepness of the terrain. At the hill crest we passed Agua Caliente, a natural hot river complete with bathers enjoying a free soak. 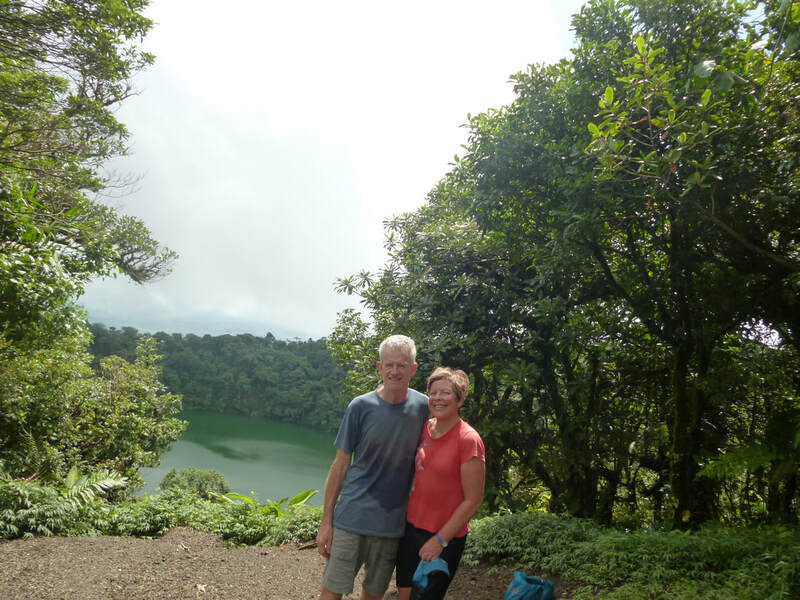 Onwards around the volcano cone past the hydro Lake Arenal before climbing through plantation forest to the Arenal Observatory Lodge complex. Arriving just in time, we took the tour with Edwardo showing We began the day finding hummingbirds just off the verandah. On our way to hike the Arenal Volcano’s little brother, Cerro Chato Volcano we heard keel billed toucan calling almost directly above us. We watched as three of them played together, and I read that birds rds often "duel" with each other using their bills, and throw fruit into each other's mouths. They 'play ball', one throwing a fruit in the air and a second seizes it. It was a bit of a thrill to say the least. 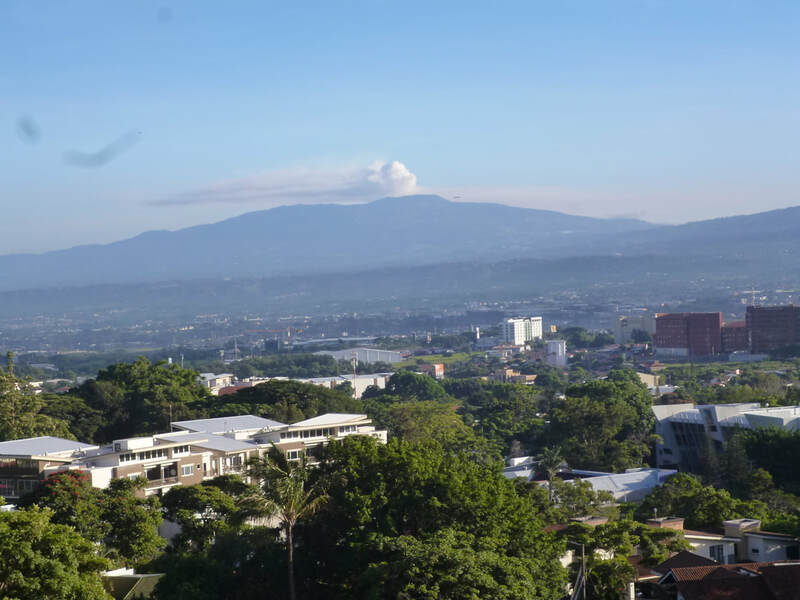 Cerro Chato (“Cerro” means mountain in Spanish) is a dormant volcano. 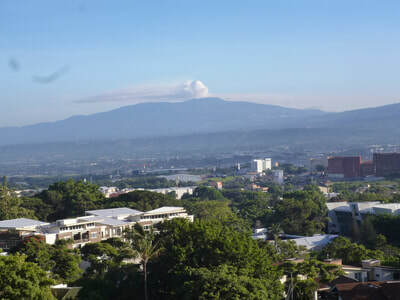 It is believed that Cerro Chato Volcano last erupted about 3,500 years ago. 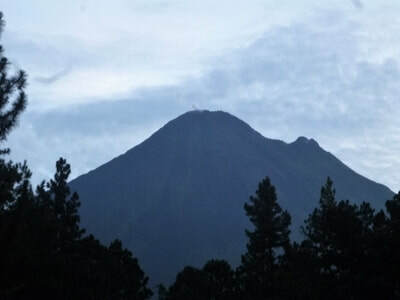 Cerro Chato’s truncated volcanic cone, covered with a thick carpet of rainforest, rises to 1,140 meters. A lagoon of bluish green water fills the 500m wide crater. We hiked through different types of primary forest – first rainforest, then transitional forest and finally in the cloud forest. The trail was steep and it was good to be exerting ourselves. Some other guests said they asked at reception about the hike and she put them off doing it because it was so hard! Not for the kiwis! A swim and jacuzzi were just the thing and then time for a rest just as it started to rain. Highlight of our walk this morning was a sighting of the lesser ant eater scavenging through the bush. ​Our jeep, boat, jeep turned out to be a mini van! We boated Lake Arenal, lugging bags over to the bus which passed through farmland over mountains, with a large mudslide a few days back, the road was slippery and we saw numerous slips of soft volcanic soil. Glad we weren't here then! Up to the clod forest more like torrential rain of Monteverde. 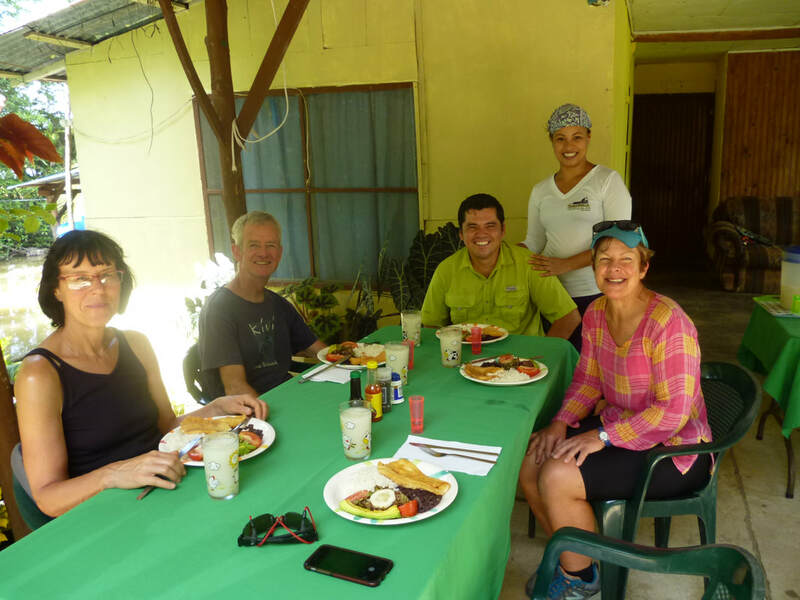 A lovely bnb awaited us though here at Las Orchedias.A lucky break with a ride up to Santa Elena reserve with others staying with us. This is a cloud forest which is a high- elevation forest characterised by a persistent, canopy-level cloud cover. These clouds provide the forest with a continual supply of moisture, which supports the fantastic array of plants that live here. Warm winds from the Atlantic Ocean sweep over the Continental Divide, cooling and condensing to form clouds as they rise. By the time they reach Santa Elena, the clouds are thick and filled with moisture. The forest is thus bathed in a constant supply of mist, which, over the course of a year, amounts to nearly 3.5 m of rain. Not surprisingly, the Monteverde cloud forest is abundant with vegetation. The competition for growing space is so intense that the trunks, branches and even roots of trees are almost entirely covered with other plants – epiphytes, lichens, liverworts, bryophytes, mosses and more. Not too different from actually. Strong winds and water laden limbs often cause branches to break and fall to the ground. This not only creates light gaps in the canopy, but also provides the forest floor with added nutrients. The insects, reptiles, mammals and birds that live here can be found in large numbers as well. Birds include the three-wattled bellbird, bare-necked umbrellabird, keel-billed toucan, long-tailed manakin, and resplendent quetzal. White-faced and howler monkeys reside here, as do jaguars, agouti, and the three-toed sloth. We didn't get to see all these but our guide was knowledgeable about the vegetation. We did see a sloth and it's baby. In the afternoon our guide Andreas explained many interesting facts about the growth, pollination, cultivation, and care of orchids. The variety of orchids in the garden was impressive, and we even got to see the world's tiniest orchid, only visible with a magnifying glass. Got away early on the shuttle to Curi-Cancha reserve. We wondered about utilizing the services of a guide, so Julie engaged him to check out his language and knowledge. 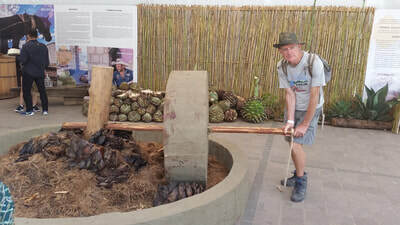 We were so glad we did, as Christian was passionate about the birds of the reserve and had worked there for many years. Best of all, he spotted a rare visitor, an bare necked umbrella bird, that he had only seen there once before. The bird gets its name from the crest that hangs over its head like an Elvis haircut. Also seen were three wattle bell bird (fu manchu bird), more keel billed tucan, bi coloured hawk, golden capped warbler, blue crowned jay, boat billed fly catcher and more. Wonderful tour and we also got to see a family of coatis. Birded out we walked back to town arriving home just before the rain. On the way we saw a crowd on the balcony of the Taco Taco restaurant, checking out a large sloth in a tree virtually in the middle of town. We went back to Taco Taco for dinner as it was close to our habitacion, on a rainy night a good move. ​​Change of location was the order of the day and we took the tourist shuttle to Manuel Antonio national park, well really the strip of hotels, condos and restaurants just outside the park. Camping up at Hostel Vista Serena. Great views of the sea from the porch of our casa. 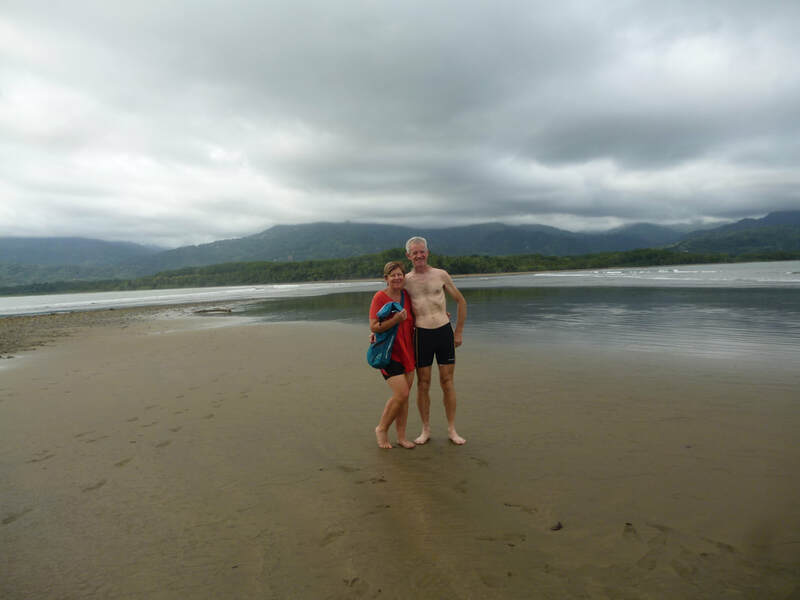 The staff advised us of the route to the beach so a swim in the Pacific Ocean was in order. A bit muddy but ideal after our time in the clouds at MV. Coffee and later dinner at Milagro patio was the best we have had so far, a fusion of the local food with lots of flavour. William is a marine biologist who takes tours through his family property (once a farm, now reverting to naturally lush mangroves). It was a joy to get off the highway going down past the rice paddy fields to William and wife Mary's home where we boarded a canopied boat. We learned about the rich life of the mangrove wetlands, that there are three varieties of mangrove, some 300 and 400 years old, as well as the value of the mangroves to ecosystems. Pointing out Jesus Christ lizards, little green heron, white tiger heron, numerous termite nests, green iguana, colony of little bats, even a tiny baby crocodile and a small boa constrictor to mention a few. We paused to watch a family of white faced capuchin monkeys. He discourages feeding or touching any wild creatures as well as explaining his role in supporting education in schools about the environment. After viewing Damas Islands from offshore near the mouth of the river, we returned to William's home and relaxed over a delicious lunch prepared by Mary, before returning home. The thunder and lightning was a great show but just before we saw scarlet macaws fly by. With the stunning backdrop as our backpackers was perched on the hillside with sweeping views of the ocean it was memorable. Quepos to catch the bus to Uvita with a lovely morning coffee at the Mercado. A local bus wound it's way along the highway,with glimpses of the ocean, a short ride so we still had time to fit in all our activities when we got here. Cascade Verde a refreshing waterfall to wash off the sweat the humidity brings. We rode bikes on the back road out to the beach, avoiding the tolls of the Parque National Marino Ballina! Walking to Punta Uvita, a distinctive sandbar extending into a rocky reef that looks like a whales tail. It's a rich area for dolphins whales, reptiles, turtles, seabirds but for us today was seeing 8 pairs of macaws flying around the coconut palms, a thrill as they flashed their bright colours when swooping into land. The rumble of thunder made us quicken our pace and we got back just in time before the heavens opened in a tropical downpour. Our accommodation is an interesting backpacker's, two rows of rooms opening out onto a large covered courtyard with dining, relaxing and cooking areas. The metal roof drummed with the rain, thunder rumbled and the flash of lightning lit the night. Occasionally a nut would fall off the palm trees and rattle down the roof, but it was a port in the storm and we slept soundly. ​Slowly the bus wound it's way along backroads to Palma Norte picking up locals and dropping them off, same as Asia, just that the buses are much nicer and there's no chickens or produce in the aisles. We passed cattle pastures and palm plantations. From there we were greeted by a hustler to take us to Sierpe and once Julie negotiated a much fairer price, actually finding out later it was below the normal amount, so he went round to the bus stop and found others to share! Then it was a wait for the boat. The trip was unbelievable, down waterways of the largest mangrove swamp of Costa Rica 330sq kms of rainforest and wetland, home to red, tea and black mangroves. Loads of water birds, caiman and boas apparently. We then surfed through the tidal currents into the sea. Bahia Drake, our new home for 3 nights, bordered by Parque Nacional Corcovado. We love our digs, high on the hills, among the treetops we hear the jungle sounds all day and night, watch heaps of birdlife including a new species of toucan - chestnut mandible, scarlet macaws and bats outside our door. Hawk Eagles, black cheeked ant tanager and howler monkeys are our wake up call! We set off early after breakfast along the trail around the coast, passing the boat harbour and several hotels. There are limitations on development within 150 feet of the high tide, but obviously some developers had got in and staked their spot before that ordinance came in to law. We passed scruffy tent camp operations, boat sheds and shacks, and wandered up to a headland, with 20 or so cabanas overlooking the forest, sea and Cano Island, but all closed up for the low season.We saw no others on our journey apart from a local school boy. Birds were largely unseen, apart form several groups of scarlet macaws that we could observe close up, they were unafraid of us so great to get so up close and personal. On the way back we were waved into a rustic home and offered tamarind juice and fresh coconut. The hostess was a Canadian who left her old life as a nurse to be with her tico boyfriend. They were camped up on his family land, making a living from the passing walkers, coffee, juice and coconut and the showing the trails on their land behind them. It was fun talking and solving the world's problems! Dinner at Gringo Kurt's was so good we went back the next night. He specialises in fresh fish, barbecued in banana leaves and his portions are big enough for two. Delicious! The restaurant has a bird feeder close by and we watched a variety of birds come and go a few metres away. 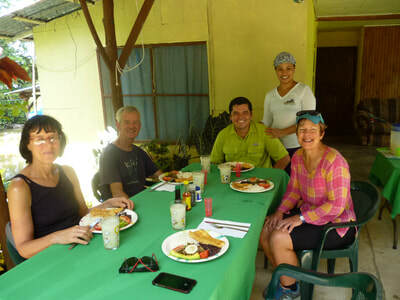 A lovely breakfast in the open air communal area overlooking all the treetops complete with the jungle sounds, Juan had bought the land off the local farmer and only chopped down two trees to build his Finca hotel. 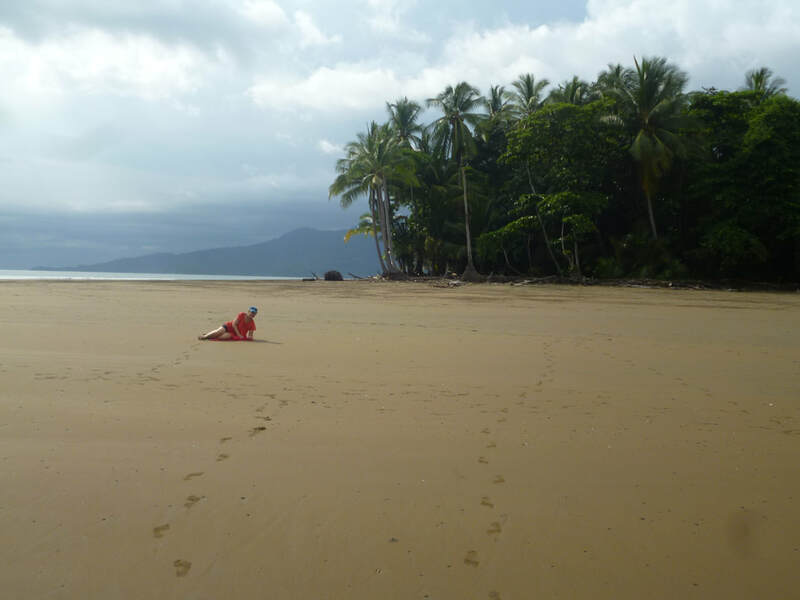 We set off again down the hills and off to the craggy stretch of coast line, sand inlets and rainforest. Unlike anywhere I've ever been due to its uninhabited, uncommercial wild state. Playa Cocalita was our place, we saw no one, enjoying the beach and it's beauty to the full. ​With heavy hearts we left our camp in the trees and caught the boat back to civilisation, and exciting ride over the bar into the Seirpe river delta. Different to see mangroves at low tide, we could appreciate how the trees stabilise and hold the banks of the river. At the dock we were fortunate to encounter Tracey (the bug lady who leads night walks for tourists), her partner John and his brother Alex who offered us a ride to the Seirpe archaeological museum, that focuses on pre-spanish indigenous culture of the region. In particular, the presence of perfectly formed stone spheres, buried in the sediments of the local rivers, that were part of the culture of 700 - 1400 years ago. The spheres are up to 2.5 m in diameter and weigh up to 25 tonnes. They were generally located at the entrances of larger houses and were thought to delineate prestige. Some are also arrayed in lines and circles and possibly have religious and/or astronomical significance. 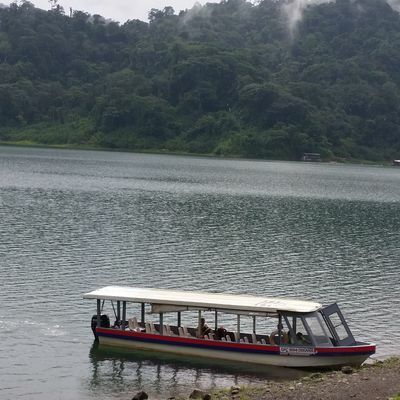 Back to earth and we boarded a local bus to our next destination, San Gerardo de Dota. Being Saturday and the mid afternoon, the bus crawled along, stopping every k or so to embark or disembark passengers and it was late when we arrived at the turnoff to the last 9 k to our accommodation. The plan was to get the owner of the soda (local cafe) to call our hotel for a ride, but no signal she said... What to do? Then a car drove by, Julie quickly ran out and buttonholed a lovely young couple from San Jose for a ride, to our hotel reception no less. Pura Vida! 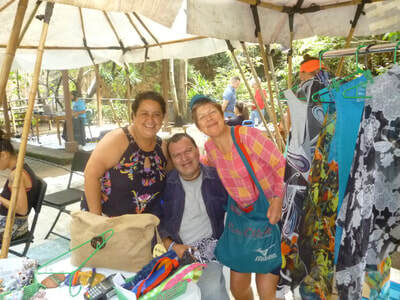 Here we were at the The Savegre Mountain Hotel, in San Gerardo de Dota, a small community in the Talamanca mountain. Another cloud forest filled with massive oaks and other native species. The forest is a sanctuary for a mammals, insects, amphibians, amazing plants and colorful birds, a paradise for birdwatchers. On our walk around the trail of 8km we didn't see anything but a squirrel and listened to birdsong, but felt their presence! The hotel is run by the Chacon Family, whom arrived in Savegre in 1954 and were the first pioneers settling down in this valley. They have not only developed the hotel but have, over the course of the years, taken advantage of the crisp weather to grow apples, plums, and peaches. Rainbow trout abound in the Savegre River which is great for fly fishing. Over 170 bird species have been observed in the area . This is known as one of the best places in the country to observe quetzals, who live here year round. The Hotel hosts the Quetzal Education Research Center Complex (QERC), a cooperative venture between the Chacon Family and Southern Nazarene University in Oklahoma. We enjoyed a trout meal up the road at the cafe and felt rested with the beautiful garden to gaze at this afternoon. Got a beauty photo of a hummingbird flying! Up early again to meet our guide for the morning's birding. Marino was one of the 11 children of the couple that started the farm on the Savegre river of the hotels name. They were persuaded by an American couple, university lecturers, to turn their farm into an eco reservation and embrace tourism rather than cattle and crops. 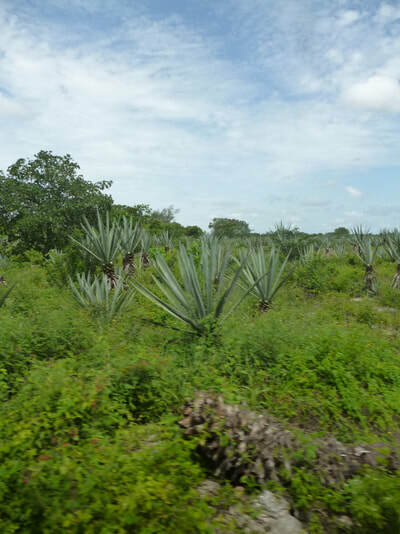 Marino took us to a grove of wild avocado trees that were currently a quetzale "hot spot". It was a bit cold for bird activity but we soon saw a female and juvenile quetzale in the trees. Other birds in the vicinity were toucanettes and wood peckers. There were a bunch of other tourists and guides but it soon became apparent that Marino was the most expert. Soon we saw the several males with their distinctive long tails. After a quick breakfast back at the hotel we were off again to a private reserve, aka more of the farm, where birds were encouraged to congregate using plants and feeders. The hummingbird feeding stations were really busy, hummingbirds whizzing around us like demented bees on speed. There were lots of other species feeding on papaya, on ground corn spread on the ground and cups of cold cooked rice. The orchard had apple, plum and avocado trees, and the philosophy was to allow the birds to feed on the crops without interference. We met Marino's brother Pablo who was supervising apple picking, nice apples but not as tasty as NZ ones. Lunch was back at our trout restaurant followed by a Mexico planning session before dinner at the hotel. Moving on day has arrived so we did an early morning walk to the hummingbird feeding station that Marino had taken us to the day before. Not as many, other birds but a nice walk anyway. Back to camp for breaky and pack up, before meeting Carlos the local taxi driver for the trip up to the Interamricana highway. He took us further along the road to a cafe where we could wait in comfort, so we shouted him morning coffee. Although he didn't speak English we could communicate quite well with our common words, quite a character. The bus down the hill to San Hose whizzed through the rain into the flat land then the traffic of SH. Inveterate travellers now we ignored the taxi touts and negotiated the few blocks to our Coca Cola bus station and the trip to LaPaco. A warm welcome by our dear hosts and we were back in the lap of luxury. That night we shouted them dinner tipico and then a deep sleep. Our last full day in CR saw us present a huge pile of washing to our dear pixie Norma, breaky with Sandy & Harry before catching the bus to towards town for a walk at Sabana park, which used to be the old aeroporto. Unfortunately the Art Museum there was closed due to a power outage, so we headed back to camp and a relaxing afternoon, fortunately for us as it commenced to rain heavily with a massive thunderstorm. Dinner with our hosts again who have made us so welcome. Due to leave Costa Rica 11.59 am we were at the bus station at 7am, the airporto by 8am, check in didn't open until 9am so but weren't we well organised! No repeats of Panama where we had to wait squashed for a very long time. Everything smooth from there until we reached Cancun where we hit the heat and the crowds. The queue went on and on, then wait for bags, then wait for customs, even targeted for a search! After hours and half it was looking for the bus avoid a rude tout and wait for the bus. Then we realised we had little in the way of directions so that was an exercise. Finally got some clues and made it to Ana and Hectors. Things took a good turn then with a warm welcome. We caught the ADO bus to Tulum, very comfortable. Followed the instructions to our apartment at edificio bliss, well appointed but could only stay one night. Went out for lunch then used the bikes to head down to the beach for a swim. Beautiful warm blue water very refreshing. Was the early morning of the ruins. Right on the coast with the turquoise waters below, we beat the crowds. With the temple of the wind god poised on the edge of the coast and other mysterious stone buildings and watchtowers, it was an interesting ramble. A swim was the order of the day. We awoke to rain, our first in Mexico but it didn't last so we set off along the highway inland to the Grand cenote. Our early start policy and we were the first in the pool, beautiful clear if a bit chilly water, 5 m below the level of the plain in a limestone cavern. Typical limestone formations stalactites and stalagmites that you could swim around. The cavern went in for about 30 m at the deepest although the water was never more than 5 m deep. Spooky. Little fishes and turtles swam around while the air was alive with swifts and bats, and a beautiful kingfisher like mot mot. The site rapidly filled with visitors and is especially popular with tour groups, by the time we left there would have been 50 people in the pool. Back to town and on the bus to Coba, mayan archeological site. We hired bikes as the site is set out over a wide area and a couple of KS between temples. It one of the few places tourists can climb the pyramid, certainly worth it for the outstanding view out over the jungle. It was a cloudy day and with the secondary forest overhead made for cooler conditions. We even had some of the sites to ourselves! 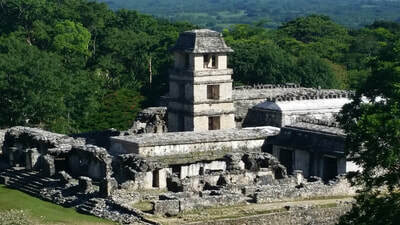 Generally the ruin consists of pyramid and cone shaped structures constructed of limestone blocks, not as big as the blocks at Machu Picchu but never the less impressive considering they didn't have steel tools. Some of the structures housed large stone steels but the detail on them had largely been eroded over the years. Vegetarian for tea falafel and cheese tacos yum. Today we caught the bus backwards to Playa de Carmen and had the bus all to ourselves! Apart from the haggling and negotiations getting the ferry ticket, a smooth journey to our bnb Villa Escondido. An oasis from the heat and hussle with its pretty garden and pool, we were made so welcome by Magna. Loved their little book of tips. Candles at night to show the way and guests fridge and sink were great. We biked up North of town to Playa Azul beach for a lovely swim, the water is amazing, don't think I have ever swum in anything so blue. Dinner was fun with a large Mexican platter at Cozumels oldest restaurant. The waiter Dennis was a good laugh and we people watched from our vantage point but it's a bit touristy. The morning was spent over a dated but interesting look at the ecology of the Island, formations of the coral reefs, the Mayan and Spanish history and artifacts. That filled in time nicely in prep for our dive! The first wall dive had a current so strong it must've taken us half a km along! The reef fish were big and great to see at least four turtles, one real biggie. Second dive was at a place they call Paradise, we hit the bottom to find schools of pale fish swaying together in the surge under coral out crops. Our guide Edgar showed us lobster, eel and shrimp. Moving on day first a ferry to the mainland, then 4 hour bus ride to Merida, the capital of the region. The bus station was a few blocks away from the historical centre where the tourist accommodation was located, but we managed to walk through the grid of streets during rush hour to check out some places. Fortunately we found a suitable room just as the heavens opened with a heavy downpour. Dinner was in a lovely colonial building Yukatecan specialities which are a bit heavy going for Julie at this time of year and well, gravy? Jo loving the pork and meat but gets a bit dry at night with the large intake of salt! Started the day with a free walking tour of the city with an enthusiastic guide. Sofia showed us the Cathedral and another church that the spaniards had built from demolishing mayan structures. We looked around the university building and a couple of plazas that have been in use for hundreds of years. A good primer for our later expeditions. While inside we heard a few crashes and roars and can out to find that a big rain storm had passed through and there was considerable surface flooding evident on the bus ride back to town. 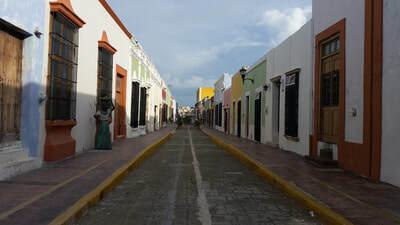 Despite feeling tired it was out again for a delicious Mediterranean meal for a change and a visit to Palacios De Gobierno the government buildings that house murals and oil paintings of the history of the Mayan and their interactions with the Spaniards. Pretty black especially as they were so well done and huge. 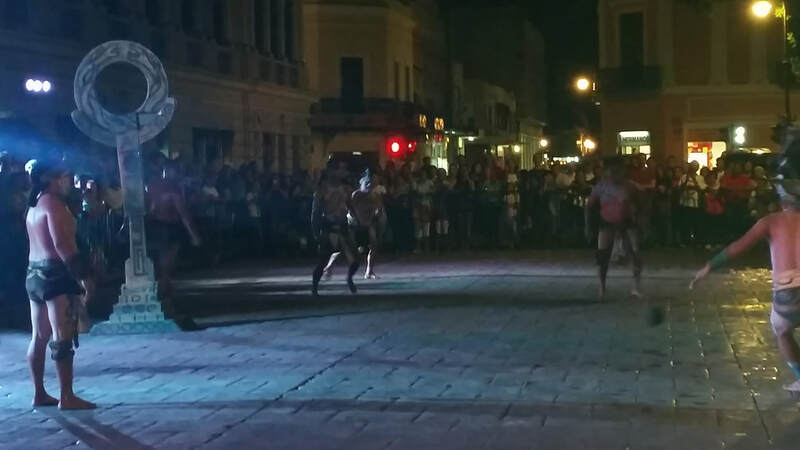 Then to see the ancient Mayan ball game where they play with their bodies crouching sideways to biff the ball with their hips. In the old days the captain of the losing team was slaughtered, literally! 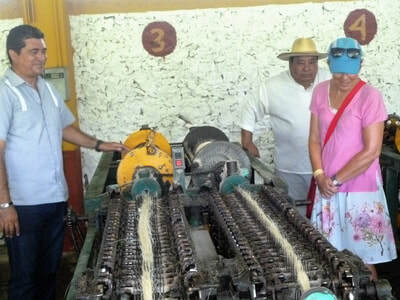 ​De Souter de Peon hennequin tour, all about sisal which we love from our carpet at home so when we heard about a tour of a hacienda where it was grown we leaped at the chance. Hennequin was a major and valuable crop in the Yucatan area from 1850 to 1950, when it was superseded by petroleum based synthetic products, causing a collapse in the economy of the area. The history of the plantations is a dark one, the workers were largely indentured slaves to fabulously rich hacienda owners, and the fiber was so useful it commanded a good price. Ropes, sacks, hessian scrim and carpet all made from the fiber. 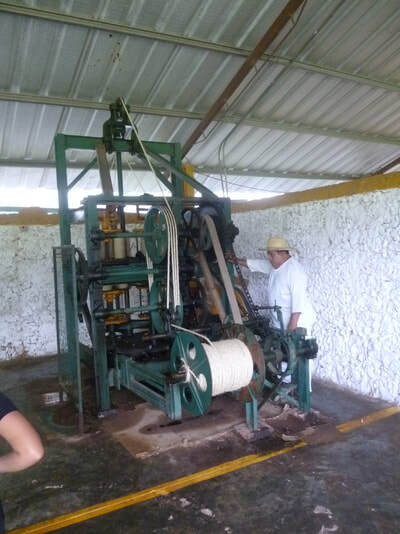 It was shipped in 200 kg bales from a port named Sisal, so that is what the world considered it called. The ancient mayan people used the fiber (siskin) for a variety of purposes, such as footwear and backpacks. Hennequin plants grow slowly, take 7 years to be ready for cropping, produce 14 leaves per year and last about 25 years before flowering and dying. Our included a swim in a cenote which we climbed down into the black hole of a cave and a meal, plus transport so a great day out. 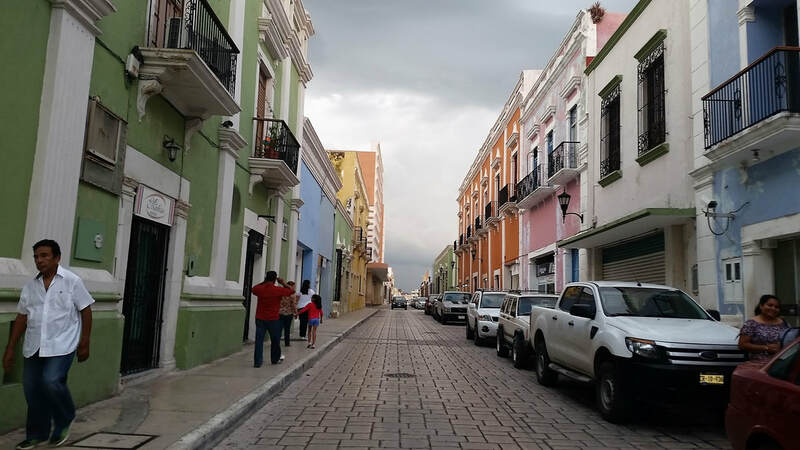 A wander down the Paseo de Montejo a wide Boulevard with European influence in fine mansions built by wealthy 19th century families. Up to catch the bus at 6.45 all ready and poised but no bus for an hour. Ado gl was very comfy though lots of leg room and being up the front there was no neck craning nor the smelly banos if seated down the back. Oh but a long long trip, what should have been 5 hours is now 9 because the buses go round the long way to avoid the problems of thieves. In early April this year, seven masked men carrying firearms and knives stopped a bus carrying Germans and boarded it, taking cash, credit cards and other belongings worth an estimated 25,000 pesos from the passengers. The road is also meant to be in pretty bad repair with roadworks and very windy. San Cristobal so cool after Palenque. Narrow cobblestone roads and a great character walking street where we were assailed by colourful women selling crafts of embroidery and trinkets and many tourists. La Lupe was a good food choice with chicken tacos and grilled veges still sizzling. We met Caesar in the square for a tour to San Jose Chamula, one of the Mayan groups named Tzotzil, a community that live in surrounding the hills, 10km from San Cristobel. They have strong independent beliefs and as a result of this anyone who diverges is kicked out. Consequently there are satellite barrios around the outskirts of San Cristobel, and these are the people doing the hard sell of beautiful crafts to the tourists. They wear black woollen skirts and the men white woollen home spun tunics. We went to visit a head man who has the responsibility of paying his own way to dedicate a year of their lives to worshiping and maintaining a shrine and going to chuck to clean the wax from the numerous candles off the floor. It was an eclectic mix of christainty as they believe in John the Baptist and other disciples but put their own spin on it. With the shaman performing medical ceremonies and waving branches, Temple San Juan was the most interesting church so far. Pine needles scattered everywhere, chickens being sacrificed, copius candles, coke and raspberry soft drinks being offered for prosperity, good harvest, freedom of illness. The smell of copus incense and worshippers praying with their circle of candles made us feel the church was a real happening place, so busy! beautifully embroidered blouses. We saw loads and loads of flowers in the church and enjoyed visitng a family who cooked us tacos and sold us sugar cane bosh, very sweet but flavoured with cinnamon and hibiscus! One of the girls showed us how to weave with a back loom. Herbs, dry for 4 days, strip, rub, mix wala all ready. Oregano, rosemary and thyme. Garlic, peel, and blend with ginger in oil. A slow day spent enjoying breakfast at our delightful cafe. The coffee here is nothing short of divine, grown in the hills and everyone plays their part in the process Mr Jesus from cafeology an expert who gives seminars told us. Despite all the time on our hands we still had to do a bit of a rush to get to the appointed hour for a tour of Casa Na Bloom however it wasn't until 11.30, Mexican time! Our guide was Pepe and he was excellent and very passionate about his subject. The night was given over to sitting at an outdoor restaurant people watching as San Cristobel as the ladies tried to sell us their colourful ware. Many tourists were wearing the same woollen jackets due to the cool evening. The throng of people around us made for a noisy and characterful setting. Another slow day where we finally set out for the museum of textiles. Inside the Ex-Convento de Santo Domingo who ruled the Chiapas during the colonial period, this museum showcases over 500 examples of handwoven textiles from throughout Mexico and Central America. Two permanent exhibition rooms display huipiles (sleeveless tunics) – including a 1000 year old relic fashioned from tree bark. 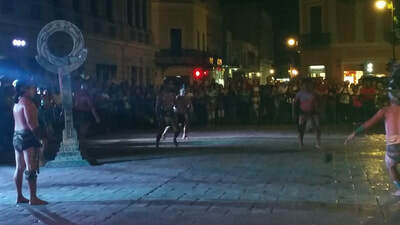 Videos show how materials and clothes are created, and also the villagers at a dance wearing their costumes. The clothes were a visual feast and we could have spent hours opening the drawers containing examples collected over the past century of local Mayan villages' creations. It was a great if cooler place to hang out during the heavy downpour and fill in the hours before our 8pm departure on the bus for Oaxaca. The next hours were spent feasting on fish tacos and pasta at a small lovely restaurant then cocoa and cake at our sister cafe. We then carted our belongings to the ADO station for the bus. It was a flash bus (GL) with reclining seats, and fortunately they showed a Rolling Stones doco which killed time until 10pm. Sleep was difficult as the road was bumpy and very windy but the night passed fairly quickly and we rolled into Oaxaca at 8.30am. ​Another slow day where we finally set out for the museum of textiles. Inside the Ex-Convento de Santo Domingo who ruled the Chiapas during the colonial period, this museum showcases over 500 examples of handwoven textiles from throughout Mexico and Central America. Two permanent exhibition rooms display huipiles (sleeveless tunics) – including a 1000 year old relic fashioned from tree bark. 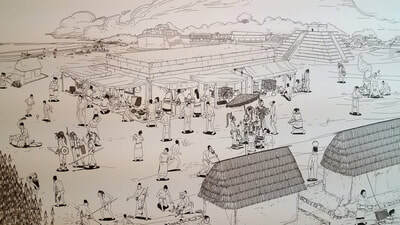 Videos show how materials and clothes are created, and also the villagers at a dance wearing their costumes. The clothes were a visual feast and we could have spent hours opening the drawers containing examples collected over the past century of local Mayan villages' creations. ​Arrived at 8 am and we're able to check into our hotel Quinta Roca. It was a bit far out of the centre of town but we quickly appreciated the warmth of our host Miguel. He cooked us breakfast before we set off on the local bus to the mercado at Tlacolula, 15 km away. It was very busy with all manner of goods for sale, the food hall had a section where you could buy meat and get it barbecued (or cook it yourself), so much smoke everywhere you could hardly see the other end of the hall. There was also an beautiful historic church, dripping with gold gilt and saintly carvings. On the bus and back into town, unfortunately being Sunday a lot of restaurants were closed. 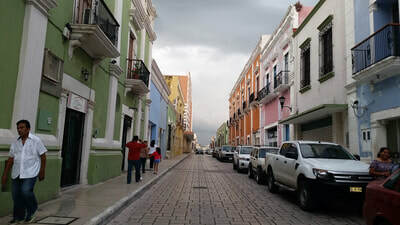 We settles on Dansantes, number 2 on TA and had a wonderful meal, Guelaguetza is the festival on now with magnificently decked out costumed locals dance their regional colonial fusion with their indigenous festivals with Christian celebrations for Carmen del Virginal go back to the 1930s. We watched a dance until feet ached, then home for a goods nights rest, pretty full on day! A late start after a big day yesterday, we cruised into the centre of Oaxaca for Brunch at a highly rated bakery, Brulenc, and had to wait coz the place was so popular. No wonder, delicious cafe fare. Then around to Expediciones Serra Norte to tee up a hike in the mountains. Then we checked out a few accommodation options but nothing was as good as our current lodgings, Quinta Roca. For dinner we went to the local fish shop that our hotel proprietor Miguel recommended, only 200 m away. An early start and off in a taxi to Chuajimoloyas, a Zapotec hilltop village 55 km away. Breakfast in the local comidore of pan and wild mushrooms and coffee, talking to the proprietors grandson, Antony, who was visiting from LA. Born in the US, he can travel but his parents are stuck there as once the leave, the can't get back into the states. So sad. It is mushroom season and the village had just had a clebration of mushrooms, with food and dancing. We set off with our guide (GPS) along the road, then onto a forest trail that would have been hard to follow without him. The lookout is at 3200m from where the trail descends into the valley then a slog up the other side of the valley to Latuvi, smaller than Chuajimoloyas but splendid location with outstanding views. Dinner there at another comidore Linda Vista run by Norma who fixed us a plate of beans, rice and chicken. We enjoyed the roaring fire in our room and fell into a deep stupor. We set off with our guide Diego, who didn't have much English but acted as our GPS. The trail started on the ridge that the town runs along befor descending through oak forest to the river edge, we followed the ancient Camino Real path that had been in use since Aztec times, connecting Oaxaca with the Carabean coast. In places there were still stone retaining walls and paved surfaces from the original trail. The river valley it followed had farm fields along the flood plain but gradually got more and more rugged until we were walking in a steep sided rocky gorge. The trees were festooned with bromiliads and air plants and the ground covered in spiky succulents. After 4 hours the path climbed through more oak and pine to the higher ridges and joined a road leading to the community of Lachato, site of a beautiful old chuch. The path continued to the second community of San Miguel Amatlan, where our cabana was located. It is situated on the edge of a high rocky promintary affording spectacular vies to the north and west. After we located a cevaca (the previous party could not) we were really pleased! Off with our new guide to the mines of silver and gold for a 4 hour walk through the cloud and drizzle and sun that was the weather order of the day. Only a brief break before heading back up to Lachatao and lunch, delicious tortilla topped with tomato sauce and egg. There our self appointed guided Luis found us thanks to the community communication and he took us on a tour of the community museum and the 17th century church that was full of amazing sculptures. We then headed off to the pre Hispanic site Cerro del Jaguar poised high on the edge of the forested highlands. It was exhilarating especially as we had the whole time rarely seen tourists and it was atmospheric being alone there. Went to the cultural museum but far too much for one day so will return tomorrow with fresh eyes and legs. Dinner at Casa Oaxaca, tuna cervich and rabbit in mole, superb. ​On a mission as we have now been here long enough to know the best brekky spot. Shared a table with locals so that was fun. Armed with the best multi grain since leaving NZ went to the museum. It is a huge museum in a large and beautiful ex-convento. The items found in tomb 7 at Monte Alban were wonderful. 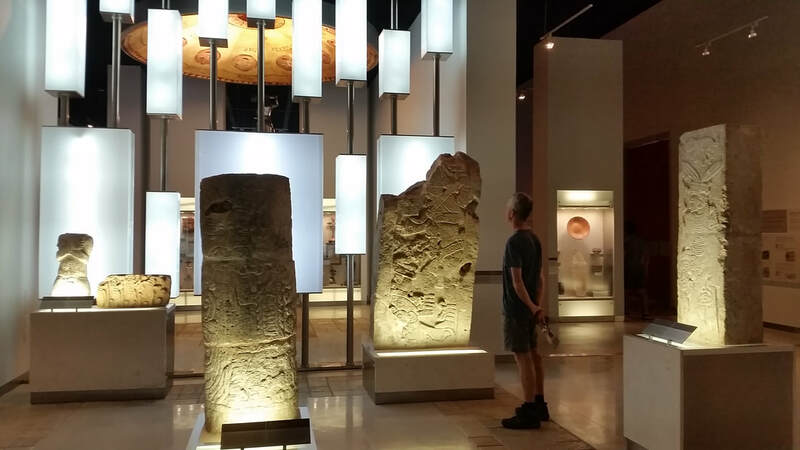 There were other rooms devoted to different parts of Mexican history and Oaxaca's place in the history including artifacts from colonial Mexico and the Revolution, and exhibits illustrating the modern day life of indigenous peoples of Oaxaca. It was one of the loveliest views of Oaxaca from a balcony overlooking the Jardin Ethnobotanico- the impeccably manicured Jardin and the mountains around. The friars who built this knew how to frame a view! We wandered past the mezcal festival park so it made perfect sense to drop in and as Jo fitted the over 60s bill it was free! We wandered round the beautifully constructed stands chatting tasting and had a great time! We were going to get back to Miguel to check the laundry had come in but we got carried away with the mezcal so we got back and no laundry which lead to some angst! Tickets to Puebla at 8am on a Sunday.....good ol Miguel to the rescue! ​On the bus to Puebla over high mountain passes and forests of cacti. We had front row seats and as always ADO provide a great comfy service so we sat back and enjoyed the show. 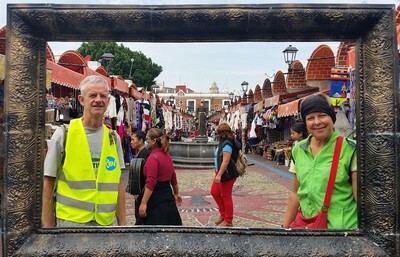 After a drop off 5km out of town we had to catch the local bus that let us off at Zocalo but I didn't think thats what driver said so sat there like a ninny. We quickly found our habitation in a massive grey stone hotel and went off to vist Amparo Museo, a wonderful place to visit. Just the building is amazing. It was a unique mix of traditional and modern spaces that flowed. The permanent exhibit is wonderful, they have impressive pre hispanic artifacts very well conserved. The way the museum design is wonderful, it takes you through the patios and corridors rather like a maze of different rooms. In the upper floor they have a nice collection of objects from the nineteenth century and a traditional kitchen. At the top there was an amazing view of the city, specially the Cathedral domes. Bike tour with Karla ROL Tours. My TA review......We had the greatest service right from the beginning when making contact with Karla. Even though it was just the day before when we wanted to go she was really onto it! 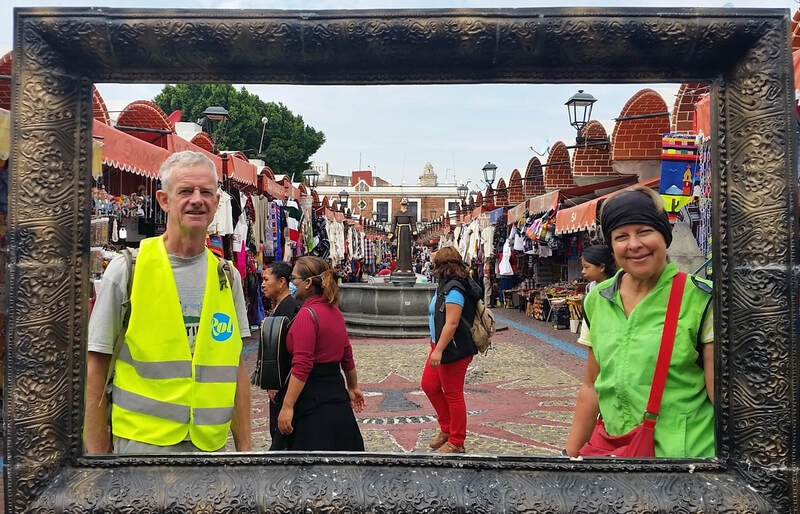 To learn about a place on a bike is a blast for me, seeing for myself up close and personal and hearing all about the people, the culture, history, architecture, arts wow! 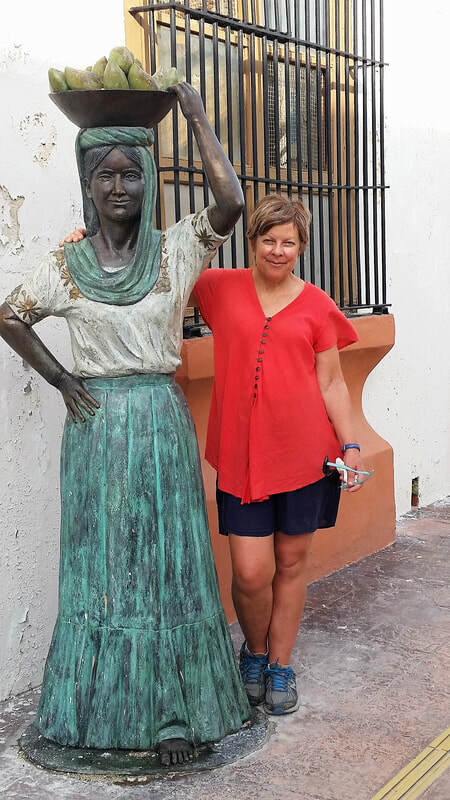 Karl obviously loves what she is doing and she is an enthusiast and advocate for the sporting culture of Puebla. She also shared ideas for great places to eat and places to visit that are invaluable. In fact we are still communicating as we wind our way around Mexico, I am still asking for her expert opinion! 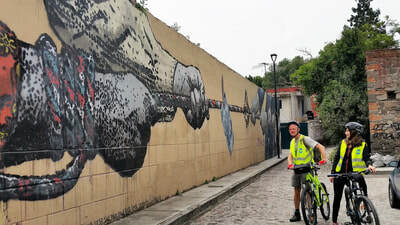 Then we found Karlas no 1 rec for lunch El Mural de los Poblanos. The restaurant is located inside a large courtyard with beautiful murals on the wall. The decor was upscale, traditional Mexican. The ambience at El Mural was formal here we were in sweaty t shirts and shorts! The clientele appeared to be upper class with a number of families and business dinners so we didn't fit in at all! Never mind they tried not to look and we felt accepted! The menu is extensive, no Mexican campesino! We started off with the chalupas, tortillas with red and green chilli and a cactus salad. The food was prepared well with very fresh ingredients and great presentation. To walk it off we lugged our bags down the street 10 blocks to the Cholula collectivo bus and managed to get a directo bus, which dropped us of near the center. After a short B&B hunt we settled on Casa Calle, el cheapo in the square, a basic and noisy option but suited us due to the late hour. Off early again, coffee and a brisk walk to the top of the pyramid, where the Spanish had built yet another church. This one was beautifully restored and the location had a fab view of the countryside and urban sprawl back toward Puebla. 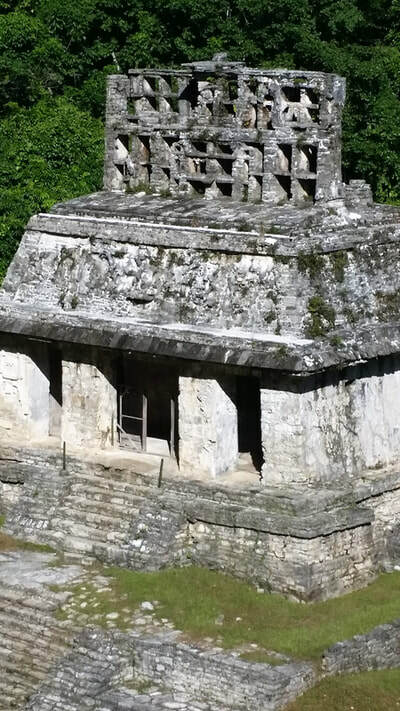 The pyramid dates back to early times and archaeologists have tunneled into it to learn more about its past. You can walk through about 800 m of these claustrophobic tunnels and get a feel for the stone faced adobe brick core. Evidently it had been modified at least three times over the ages. Attached to the site was an excellent museum and art gallery, detailing the volcanic eruptions of Popocatapetl, pre- Colombian artifacts, Spanish religious iconography and the work of presant day local artisans, who take inspiration from the pre - Colombian styles. ​Pack up slowly and make our way to Mexico was the plan, we though ourselves pretty clever catching the local bus back to the inter-city bus station CAPO. The bus had other ideas, winding through the narrow streets, doubling back but finally pulled in the huge bus station. We were old hands at this part of the game now and easily booked tickets onto Mexico city. The TAPO station was bigger again but the connection to the Metro was straight forward and after 7 stops we were on the streets of Mexico City. After a bit of drama checking in at our prefered hotel we were finally ensconced in the lap of luxury. A short walk In the city with huge streets for beer and milk we found a little cafe with beaut salads, replete! Then it was back to our hotel and pack up and move to our new digs, a flat on the 10th floor in an apartment building with a lovely couple Marta and Manuel. 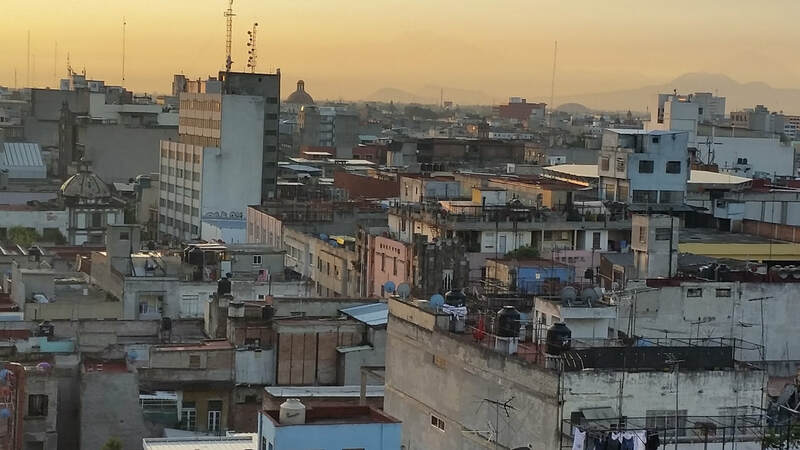 Our room had a great view out over the rooftops of the surrounding buildings and across the city to the volcanoes on the horizon, Itzy and Popo. We knew their profile from their other side in Pueblo and Chalula. Next stop was the archeological site Templo Major, which was literally dug up from under the foundations of Mexico city. The open air excavations showed how the ancient builders coped with the soft and waterlogged soil when building heavy stone pyramids. The internal museum displayed artifacts and huge stone carvings from the site. Up early to figure out the way to meet our cycle tour ended up on the subway in rush hour, cheek to jowl with the workers. It would've been OK except we had to wait mid tunnel when the train stopped. The stuffy claustrophobia was hard to take. As I looked around I did see people coping though, shutting their eyes to it all and thought that is their lot, they put up with that distress day after day, wow. Off the train and up the road (ol' Paseo Reforma ) to the bike station, set beside a cycleway that once was a rail line. Our guide Honorato took us through back streets, parks then a cycleway through the busy city, then on to leafy suburbs, Condessa and Roma, a bohemian artist's area then back to Chapultapec park and the base. Next stop was the Museum de Anthropology, a world renown facility show casing Mexico's history and culture. It starts in hall one with a display of human evolution from an ape ancestor and the climatic changes in Africa that drove the development of mind capacity and the use of tools. Then it showed the migration of humans into the last continent, America, and the changes wrought on the mega fauna that resided there. 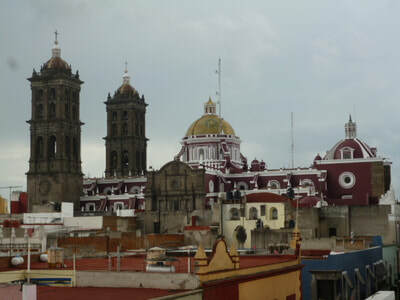 After that each hall focused on the history of separate ethnic group, Maya, Mixotec, Aztec and so on. On the second floor the displays focused on the current ethnilogical and social a tributes of a range of different cultural groups that exist in Mexico today. By the end of the day we were pretty stuffed so a quick meal at the Japanese restaurant near our BnB and off to bed we did go. ​It is hard to put Mexico into a few words with its deserts of edible cactus, jungles, smoky snowy volcanoes, snorkeling the azure waters of the coast and cenotes. 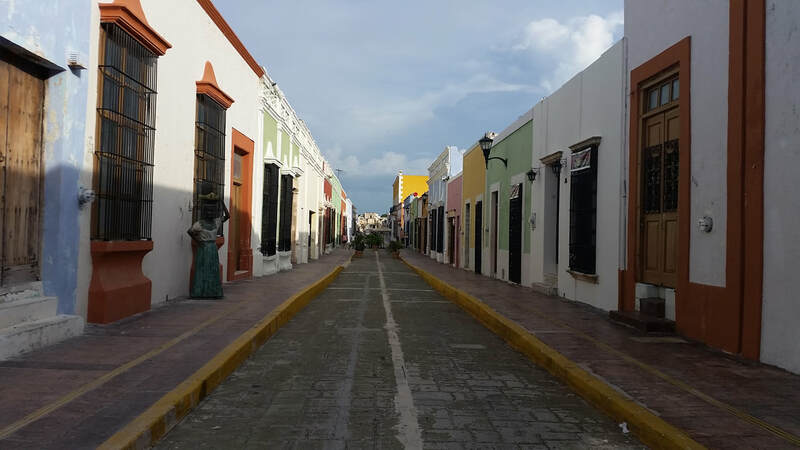 Strolling the colonial streets and hiking Oaxaca's mountains, there was loads of thrills. 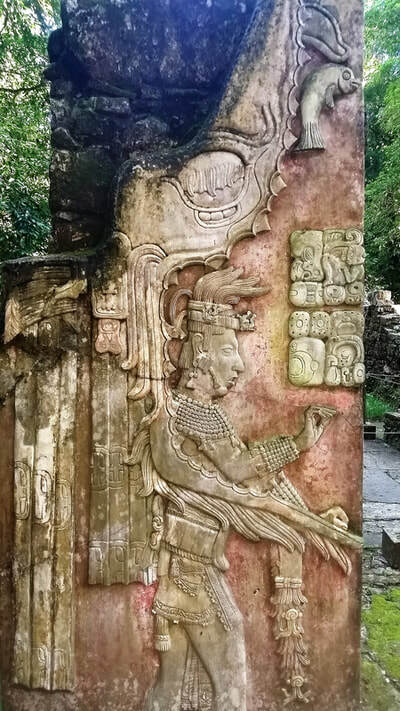 Mexico's pre-Hispanic civilizations built some of the world’s great archaeological monuments, our favourite was the exquisite Maya temples of Palenque. The Spanish colonial era left beautiful towns full of tree-shaded plazas and richly sculpted stone churches and mansions, while modern Mexico has seen a surge of great art from the likes of Diego Rivera and Frida Kahlo. Top-class museums and galleries document the country's fascinating history and its endless creative verve. Popular culture is just as vibrant, with the street art to the wonderful handicrafts of the indigenous population. At the heart though was Mexican people. from Mexico City hipsters to the shy indigenous villagers of Chiapas, they’re renowned for their love of color and frequent fiestas, but they're also philosophical folk, to whom timetables are less important than simpatía (empathy). You'll rarely find Mexicans less than courteous. They’re more often positively charming, and know how to please guests. 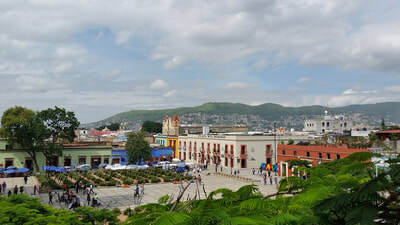 They might despair of ever being well governed, but they're fiercely proud of Mexico, their one-of-a-kind homeland with all its variety, tight-knit family networks, beautiful-ugly cities, deep-rooted traditions, unique agave-based liquors and sensationally tasty, chili-laden food.